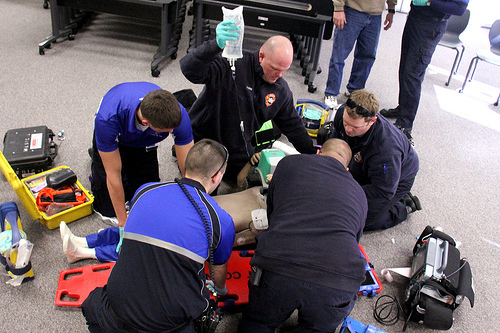 The Scott Community College Emergency Medical Services (EMS) program prepares students for successful completion of the Iowa/National Emergency Medical Technician Basic and Paramedic certifying exams. The EMS program provides graduates with the tools to adapt to public expectations and to take leadership roles in the evolution of prehospital patient care. Graduates will experience enhanced career opportunities because they will possess the skills and knowledge necessary to take proactive roles in Emergency Medical Services research, quality improvement, public education and system management. We have provided students with the flexibility to choose between two program options. The nine-month Paramedic Course is designed for those who want quick entry into the job market. The full Associate in Applied Sciences Degree program provides students with a much broader background and training. The AAS Degree is often beneficial to employees when seeking advancement within their profession. For more information about these options just give us a call at 1-888-336-3907 (toll free). Employment of emergency medical technicians and paramedics is expected to grow 33 percent between 2010 and 2020, which is about as fast as the average for all occupations. Earnings of EMTs and paramedics depend on the employment setting and geographic location of their jobs, as well as their training and experience. Median annual wages of EMTs and paramedics are $30,360. The middle 50 percent earned between $11.13 and $18.28. The lowest 10 percent earned less than $19,710, and the top 10 percent earned more than $51,370. EMS graduates are employed at fire departments, emergency services providers, hospitals organizations and clinics throughout the Clinton, Muscatine and Scott County area.